During the Armed Forces Communications Test, listen just outside the US ham bands and you'll find military stations calling and listening on some frequency inside the ham bands. This is good practice for operating split and you'll receive unique QSL cards, too. There are lots of short sprint contests to squeeze in around the spring chores, too! This year's 12th annual US Amateur Radio Direction-Finding (ARDF) Championships will be held in Southern California in the mountains east of San Diego beginning on May 30-31. These well-attended outdoor exercises attract many spectators and are the qualifying run for the world ARDF championships to be held in Serbia in September. 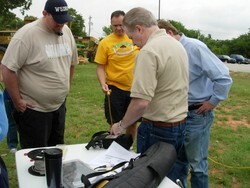 ARDF is very popular around the world and a great way to mix ham radio with outdoor sports. A recent QRZ.com feature described a new "interpreter badge" from the Boy Scouts of America - for Morse code! Scouts that learn to send and receive at 5 wpm (sound familiar?) earn the right to display an interpreter badge with code that spells out Morse. With the number of mobile devices increasing every day, it's surprising that there aren't more "mobile apps for mobile ops!" Nick N3WG has been busy creating tools and software as Pignology - check out his collection of ham apps and growing set of interfaces to some popular portable radios. Using his new Pigtail kit and an iPad, this video shows him using the CW Terminal sending CW on a KX3 rig using a Bluetooth keyboard and logging contacts on his Ham Logger app. Speaking of keyboards, do you miss the full-size keyboards that used to be the norm for computers and electric typewriters? Bob N7RDP recalls, "...they had bounce-free mechanical switches, were heavy enough to stay put and you could type real fast and not have to watch what appeared on the screen. I was surprised to learn such keyboards are still available for PCs from Elite Keyboards. Typing on one, my fingers just seem to go faster. Or maybe its the clacky sound that makes it seem that way." Charles KG2V found USB equivalents, too. Web Site of the Week - Electronic Design's Lou Frenzel, known by hams as W5LEF, has been busy generating great articles such as "What's The Difference Between Bit Rate And Baud Rate?". If your answer is, "There's a difference?" then you need to read Lou's article. Soapbox - after-the-contest comments are called "Soapbox" because of the somewhat antiquated reference to "standing on one's soapbox" to make a opinion known. Soapboxes haven't been heavy enough to hold a person's weight in about a century but why mess up a good word? Reading the soapbox comments after a contest is part of the fun - check out the ARRL's online Soapbox for all ARRL contests and be sure to drop in your comment and photos! 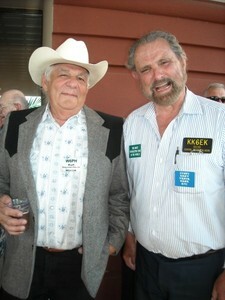 Jim K1TN writes, "I really enjoyed TV Bob's (N6TV) photos from Visalia. A lot of work to take them. Really appreciated, Bob. I swear, someday I will make it to Visalia for the convention." As one Visalia-goer commented, "Very high calls-known to calls-seen ratio!" How does a KX3 kit get assembled? You can watch Steve WGØAT do the job through the photos of John AE5X and the slide show ends with a video of the finished product in QSO with Dave AA7EE. Alright! How can you resist watching a video about a 10000-rpm ping-pong ball and liquid nitrogen? You can't! Here it is! 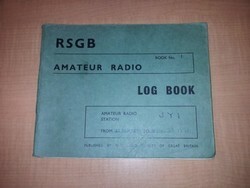 Writeup author Nate N4YDU writes, "I'm currently working on the results article for the 2012 ARRL DX CW contest. I'm looking for any bad luck or "Murphy" incidents that took place while you were operating or preparing to operate. If I get enough of a response, I'll summarize it in the story...maybe even do a Top Ten!" Wow - an opportunity to tell your tale of woe to the world? Go for it! Have two or three different models of headphones available for long contests. A single set can create sore spots on your ears or temples that gets maddening by Sunday afternoon. Having a couple of different sets helps prevent that distraction. The same goes for chair cushions! EDN magazine recently published "High-performance HF transceiver design: A ham's perspective" by contester and WRTC2014 co-chair, Doug K1DG. The article goes into detail about the environment in which contest-grade receivers must not only operate but excel. There are several graphics of the spectrum during the 2012 CQ Worldwide 160 Meter CW contest including a waterfall display that will keep you busy trying to read it for a while. Electronic Design (5 April) - "Understanding Solutions for the Crowded Electromagnetic Spectrum" by Lou Frenzel W5LEF, covering VHF through microwave, FCC regulation, and upcoming technology solutions to the problem. IEEE Spectrum (April) - "Poor Man's Solder Reflow Oven" for adding reflow soldering to your homebrew electronics capability. IEEE Spectrum (March) - "Pocket Scope Roundup" reviews four different mini-scopes that fit in your hand, "DIY Manufacturing" about turning your one-off project into a real product, and a "Reflections" editorial by Robert Lucky asking, "Is Math Still Relevant?" Jack K6JEB posted this video showing his technique for winding toroids by using a "stitching pony" made from a lacquered or plastic chopstick. Two notes on everybody's favorite building material - here's an article from Instructables on how to bend PVC pipe and there are lots more ideas in the comments. And those plastic plumbing fittings you were looking for that join three pipes in a right-angled corner? They're called "90° side outlet elbows (slip)". "Slip" means for unthreaded connections. Enjoy. Linear Technology's Design Note 1027 "Optimizing the Performance of Very Wideband Direct Conversion Receivers" is an interesting read. DC receivers are grabbing a lot of "market share" in the commercial wireless world. Pretty much every inductance calculation you can think of is in this book somewhere! 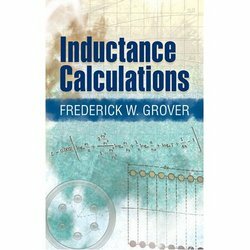 While browsing through a technical book list, I came upon the classic, "Inductance Calculations" by Frederick Grover seen at right. Reprinted by Dover from the 1946 and 1973 editions, this inexpensive volume has just about every possible formula for inductance. It's fun to just open the book randomly and try to figure out what prompted the need for "Mutual Inductance of Inclined Circular Filaments Whose Axes Intersect, but Not at the Center of Either" (page 204). On Marconi's birthday, John AE5X, "...decided to build a coherer since all the parts were already on hand. I don't understand the physics of it but it is a neat little device...seems to have a range of about a foot w/o an "antenna". After making the video I found that dipole-like leads attached to the coherer and QRP spark transmitter increased the range to 8 feet." Two IEEE Antennas and Propagation Magazine articles by Steve Best VE9SRB answer a lot of questions about how antennas interact with electromagnetic fields. Both are available through your local library or possible a university or technical department library. 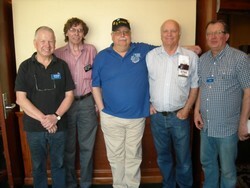 Technical Web Site of the Week - Tim K3LR reports that, "W6NL has sent me an update to his original work. It is labeled as - Updated Moxon document 2012 and W8WWV has contributed a wonderful paper on various NEC model results of the W6NL 2-element 40 meter Moxon. It is labeled as - W8WWV investigates W6NL Moxon 40 meter models. You can find all four posted documents relating to the W6NL Moxon in the Station Engineering folder of k3lr.com." With the Dayton Hamvention and many local and regional hamfests coming up, it's time to review the zoology that makes each and every hamfest a unique and interesting experience for buyers and sellers alike! Venerable Sages - Like spirits on Christmas Eve, these hamfest haunts appear from nowhere, wizened and wrinkled, call sign badge bearing the markings of extreme age. You will be told A Story that you will have never heard before about hams you may have never heard of. Yet it will be fascinating! Some day in the future, when you least expect it, that story will supply a crucial detail, amazing your friends and enemies alike. Learn to listen to the sage! Disorder Demons - There is a special position down there in the hot place where the guy with the red cape and pointy stick lives for the people who handle your carefully-sorted parts and put them back in the wrong boxes or trays. An unsuspecting buyer gets home and begins work on a project only to find that the ninth part out of ten is mismatched. At next year's hamfest, you get blamed for it. Benevelonians - Particularly fond of new hams and kids in general, these fine folks take the hamfest role of doting uncles and aunts. No matter how shy the child or unsure the novice, a Benevelonian will always come up with some trinket or extra part to give away or add to the sale. "I've got just the thing for YOU!" they say, eyes twinkling, producing a perfectly chosen gift or gadget for which they won't accept a cent. Burrowers - As we all know, the best bargains are often on the floor under the tables so a Burrower gets down on hands and knees, no matter how crowded the aisle, proceeding to root through every single box and bag, spreading and sorting the collection, creating chaos and convincing your real customers to cross the aisle to "come back later". They will then offer one-tenth the asking price on a single coil of wire and leave it on the table when you don't sell it to them. Explainers - An inquisitive buyer inevitably asks the one question about an item to which you don't know the answer. "Will this work with my 1983 Festalon Maglerator?" Unbidden, a hitherto unnoticed Explainer standing nearby will turn and deliver an authoritative and often exhaustive reply to the question, leaving both buyer and seller speechless and astounded. The Explainer will then purchase an obscure item from your table costing less than a dollar and disappear, never to be seen again. Hamfest Cowbirds - The cowbird lays eggs in the nest of other birds for its chicks to be raised by the hapless parents. Similarly, the hamfest cowbird leaves its junk on your table so you get to dispose of it. While you're engaged with another customer, they put their item on one end of the table and feign great interest in some other doo-dads, slowly migrating along the table until at the opposite end from their "egg" which they leave behind. You discover the ruse when somebody asks, "How much you want for this?" while holding up the surprise you now own. Biographers - No matter what you pick up from their table, they know its entire history beginning with the digging of the ore and the smelting of the copper. They know the call signs of every owner (before and after vanity calls) and whether they smoked and what got worked with that particular radio. They always have the manual. The only thing they're not sure of is whether a particular item is actually functional but you've had so much fun learning about it you buy it anyway. Gravity Testers - I'm sure they spend the morning greasing up their fingers with special non-stick coatings. Once at your table, they'll lift up a fragile item and then..."Oops!" Or they'll hold that power transformer over a flawless radio cabinet and..."Oops!" A variation on this theme is to reach for something in the back or down the table and..."Oops! "...knock over a stack of books or gear. Yes, gravity has been found to be fully operational at your table. Cats In the Hat - I like these colorful hamfest denizens, usually adorned with bright clothes, patches, enough enameled pins to distort the local magnetic field, friendly and loud and they know your name (or think they do), and have a handshake for everybody! They often leave your table messed up and buyers forget what they were interested in but everybody has a smile on their face afterward. You just have to watch out for Thing One and Thing Two. 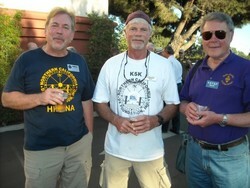 And so our hamfest memories are made - of characters old and young, rich and poor, scallywag and Samaritan alike. It wouldn't be the same without the slightly daffy denizens of our tribe, would it? Look at the time, they'll be opening the gates in an hour - happy shopping!